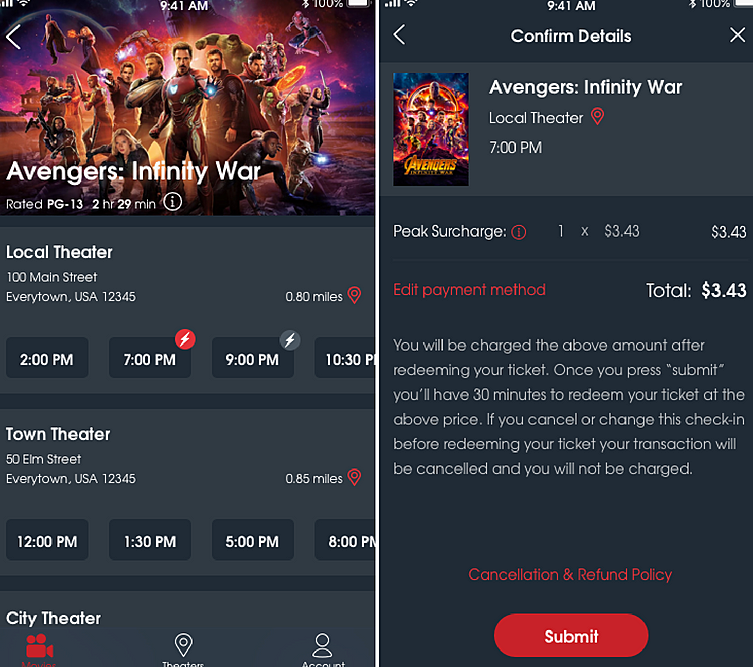 As we warned you last month, using MoviePass is about to cost you a bit extra. After reports that the ticking service would soon introduce surge pricing, that new surcharge has officially begun starting today. If you plan to see Ant-Man and the Wasp or go to another popular showing this weekend, be ready to fork up a few extra bucks. MoviePass alerted their customers to the change this afternoon in an email. Here’s how it’ll work: showtimes that are in high-demand will now be marked with two different lightning bolt symbols. A red lightning bolt means that showtime requires you to pay an additional fee, while a grey lightning bolt means the showtime is growing in demand and doesn’t require a fee yet, but could soon. In the email, an example shows a Peak Pricing fee of $3.43, but the company notes that there won’t be one fixed price. The peak fee will depend on the showtime and title – and it’ll likely vary by location and the average movie ticket prices in your area. It’s no news that the ticketing service has been struggling financially ever since they slashed their prices last fall; allowing people to see a movie a day for under ten bucks (less than the cost of a single ticket in many areas) isn’t exactly sustainable. Surge pricing is clearly an effort to help keep the company afloat and profitable, but I doubt subscribers will be too happy. Soon you’ll be able to enroll in Peak Pass, a new feature that’ll allow users to waive one Peak showtime fee a month. But regardless, you’re still paying more money. Less than four bucks for a movie is admittedly less than the $16.50 I’d pay here in NYC without a MoviePass, but if you’re someone who uses your MoviePass to see popular films on opening weekend, those new competing subscriptions from AMC and Alamo Drafthouse may sound more appealing.